There's a genuine lack of competition in consumer PC graphics, and though commentators around these here parts have high hopes for upcoming AMD Navi, the truth right now is that Nvidia is streets ahead in practically every meaningful way. That superiority has been reflected in both GeForce pricing and what appears to be a slow rollout of newer, faster GPUs. In order to maximise the newcomer's appeal, partners need to create uncomplicated cards that are compact, well-cooled, and as keenly priced as possible. 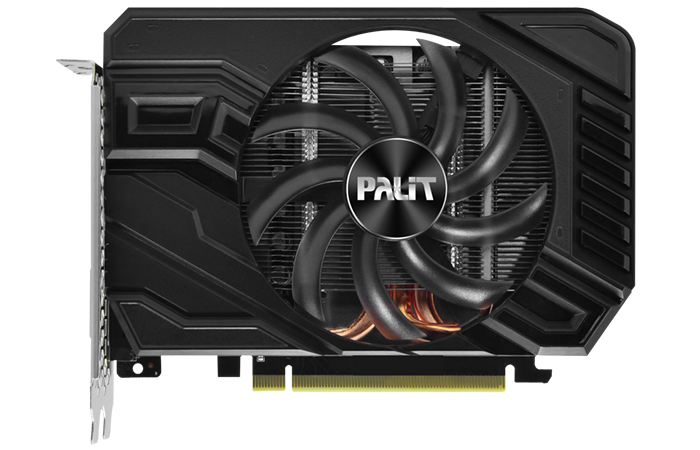 Palit usually excels at meeting such criteria, and the firm does achieve the £200 brief with its regular GTX 1660 StormX. The card that we have in for review today is an OC model that uses the exact same board design but throws in a factory overclock for an extra £15. We're quite used to seeing hulking enthusiast cards in the HEXUS labs, and Palit's GTX 1660 StormX OC is a welcome break from the norm. It's a cute little thing, measuring a mere 168mm x 122mm x 40mm and weighing just 408g. There's no need for reinforced PCIe slots with this one, and though the plastic shroud is taller than the PCB, the dual-slot, mini-ITX form factor is a fine fit for a pint-sized rig. Keeping it simple is the name of the game, so don't expect a backplate nor any superfluous RGB lighting. Power, as expected, is sourced from an eight-pin connector located on the top side, and a single good-sized fan is tasked with keeping everything cool. The fan doesn't turn off at idle, but that might be a blessing in disguise. We tend to find that 0dB fan implementation is either really good or quite poor, and on more affordable cards, you tend to end up with a fan that revs in and out of operation in a manner that defeats the purpose. There's no real harm in the Palit fan staying on at all times - it is extremely quiet at low load - however noise levels do rise when gaming, as we'll demonstrate later in the review. There really isn't a whole lot more to say about the design. 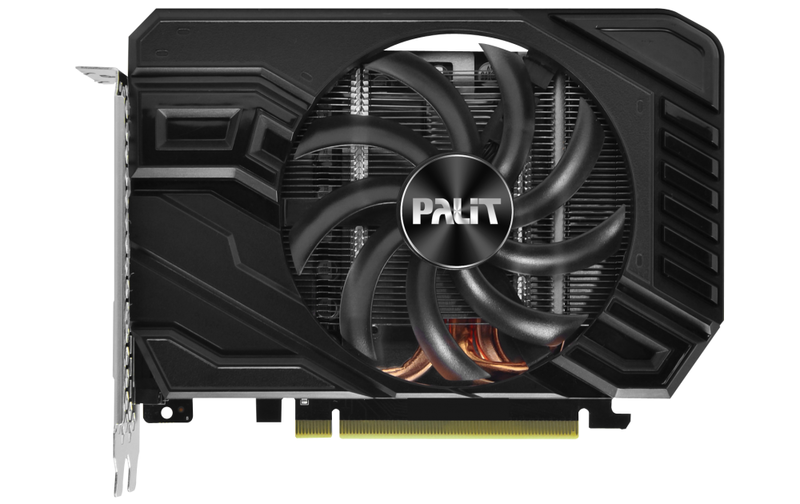 Palit uses the same triple-heatpipe cooler on its GTX 1660 Ti variant, so it stands to reason cooling performance should be more than adequate for this pared-down interpretation of the TU116 GPU. It's worth reading our previous analysis of the GTX 1660 Ti if you haven't already done so, but in a nutshell, two of the 24 SMs available on the full-fat TU116 die have been disabled. The end result is a lower shader count (1,408 vs. 1,536) and fewer texture units (88 vs. 96) for the GTX 1660. Not too big a sacrifice, but it's the back-end that really sets two 16 Series cards apart. 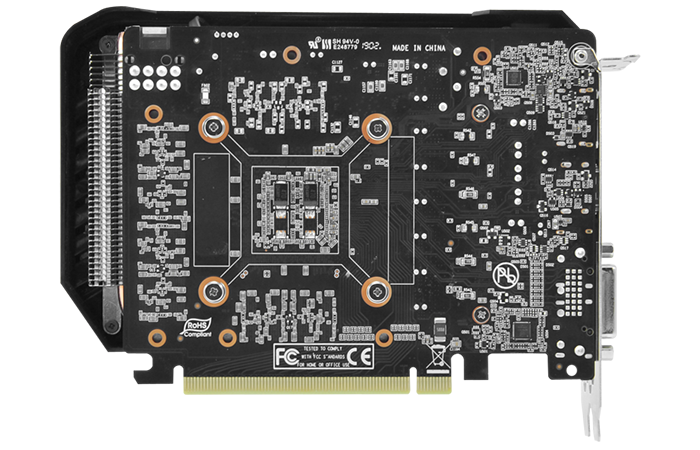 Both feature 48 ROPs, a 192-bit memory bus and a 6GB buffer, but while GTX 1660 Ti benefits from 12Gbps GDDR6, the GTX 1660 makes do with 8Gbps GDDR5. Hoping to shorten the gap, Palit's StormX OC is shipped with boost frequency raised from 1,785MHz to 1,830MHz. We don't expect the 2.5 per cent increase to have much of an impact on proceedings, and truth be told, we'd be inclined to save the extra £15 and go for the regular, stock-clocked model. Cards at this end of the market tend not to be as well-stocked in the output department, yet StormX OC still carries DVI, HDMI 2.0b and DisplayPort 1.4, so you'll have no problem driving a couple of high-res monitors. Do also remember that adaptive-framerate synchronisation is available on the GTX 1660 with an AMD FreeSync monitor - an important consideration if you're hoping to build a gaming PC on a budget - and if you're inclined to dabble with a bit of ray-tracing, you'll soon be able to do so without having to fork out for a premium RTX GPU. Enough chit-chat, let's run the games, check the vitals, dabble in a little overclocking and then reach a conclusion.